Several months ago I made the decision that this summer would be The Summer Of Sewing. Yes, I gave it capital letters, which means it is official. As an end of term present, I was gifted Happy Homemade: Sew Chic by Yoshiko Tsakiori, a Japanese pattern book that I'd been admiring and thought it was time to make a start! This is my first time making actual garments, so it's been a bot of a steep learning curve, but I'm really enjoying it. The first project I tried was the blouse with frilled sleeves. I made it out of a cotton fabric I'd had sitting in a drawer for several years after falling in love with the print. It reminds me of kobolds, little figures from Germanic folklore who ride snowflakes down to the ground. Having measured myself very carefully and according to the book, I set to work spending an entire day learning how to copy and cut patterns badly, how to gather and how to set in sleeves. When it was all done I held it up proudly to realise that I had made the BIGGEST TOP EVER. It is huge. But actually not too badly made! Aside from the basic run-the-fabric-through-the-sewing-machine bit there was practically nothing familiar to me in making it at all. Buoyed up by this, I set about making the Straight-cut Sarouel Pants. If I thought the kobold top cake out large, you should have seen these things. They were hilarious. I could have put a hoop around the waist and worn them as clown trousers. I wore them to show my beloved and bless her, she managed not to laugh until I had left the room. I tried recutting them, narrowing the crotch band, but in the end decided just to cut the whole thing out and just have the two legs. By a stroke of extra-ordinary luck, they looked great! And having looked like I was wearing a nappy, it was nice to be able to wear them without giggling at myself. I've read a few blog posts from people who have made these and loved the odd shape of them, but I just couldn't pull them off. The leftover trousers are great though, and were a favourite on our weekend trip to Venice. Airy, loose fitting and if the other clothes being worn by tourists were anything to go by, actually fashionable too. Woah. My most recent project was the Pinafore Dress, which I completely love. Having taken the hint from previous patterns, I made it in the size below what my measurements said I was, and it's a good fit. I adore the fabric, but discovered quite quickly that a double layered fabric is quite easy to mess up and pull out of shape, particularly around facings. So the armholes are a bit squiffy. I love the finished dress though, it's comfortable, somehow flattering in a shapeless kind of way (my favourite - give me a sack dress over a fitted one any day) and the right size to be either worn loose or layered. The layering here, despite August, is due to the large number of mosquitos in Venice who decided that I was the tastiest dish they'd ever had. I'm now covered in awful welts and blisters as well as feeling slightly anaemic. Though I do still go terribly slowly, I'm getting the hang of top stitching and feel quite proud of the pockets in particular. 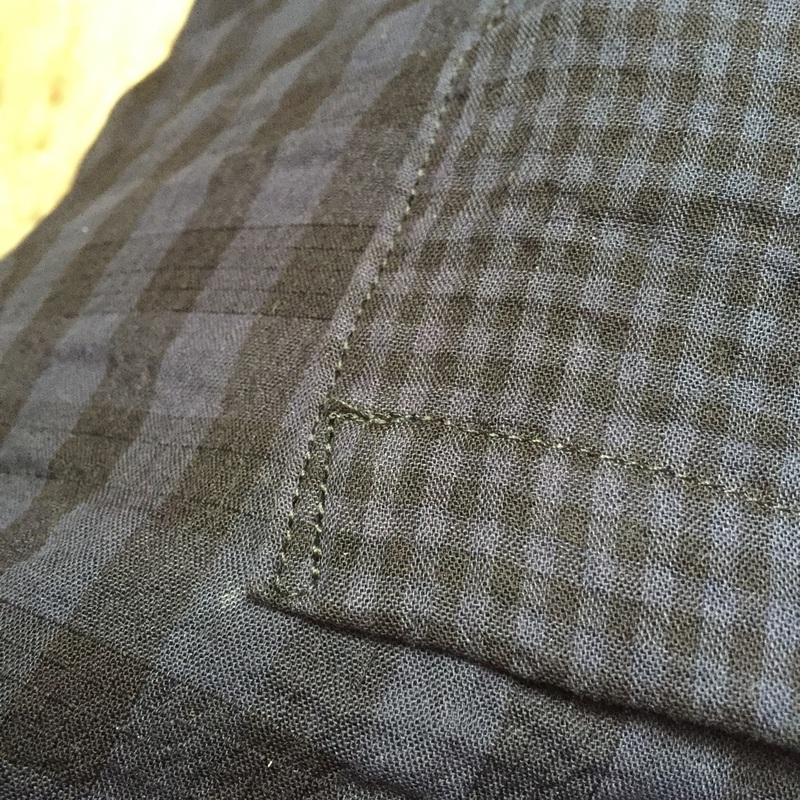 You can see here the two sides of the fabric, large gingham on one side and small on the other. I can see this dress getting worn a lot, and think it's a pattern I'll make again in different fabric too.